I walked through the Fox Chapel woods in a misty rain. April earth smelled rich and fertile as Dozier kicked it up, and ran happily before me. He nudged his snout into heaps of wet leaves and over-turned rocks by the stream. A spiral of euphoria rose in me. I felt grateful to be walking, grateful to be alive, for Dozier romping off leash, for the gift of Bill, and friends, my children. I stepped across boulders to cross the creek. I climbed a muddy hill, and snapped a photograph of the fishing pond below. I probably walked half a mile more to connect with Shadyside Academy’s trail, and then three quarters of a mile back, still warmed by happiness and a sense of well-being. A flint-colored sky hovered low, but Dozier didn’t mind either. A sudden sound reached into the quiet woods, one pure, beautiful note. Was it a trumpet? A flute? Then more sound swelled into the valley, filling the hills with haunting music. I knew I was listening to bagpipes. A few minutes later, we reached the musician. He stood with his pipes by a bend in the creek. I leashed my hundred-pound dog and lifted a hand to him. “Thanks.” A trim man, he wore jeans and a sweatshirt, and a hat against the drizzle. He played a few more measures. Dozier, trained, sat beside me. He fished a card out of his pocket for me. 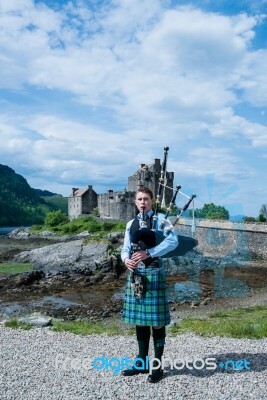 His name is Sam, and occasionally he plays for weddings and other special events, dressed in full kilt regalia. The sound of his pipes had ratified and enlarged my happiness. Wouldn’t it be great if you could have a new surprise every day? Music always brings a smile!